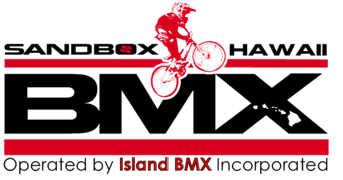 Come out for an evening of BMX Racing at the Sandbox. Registration 5-6pm. Racing ASAP. Please bring your food items as the Lunch box has been discontinued. Also, remember that the Sandbox is a pack-in pack-out destination--please take your trash when you leave. Mahalo. Come out to the Sandbox for BMX practice Wednesday 6/17 3-6pm. Free Olympic Day events at the Sandbox. We have added a Strider race on Olympic Day 6/20. Registration 2-4pm. See you at the Sandbox. Please note: Race Fees will increase $2 due to increased land-use costs. Strider Race added 6/20 Olympic Day... come on out! Come out for BMX and Strider racing tonight. Friday night Summer Series starts this week. Come out for BMX and Strider racing tonight. Single points race. Registration 4-5pm. Racing ASAP. Farewell Potluck for the Seller Family following the races. Please bring a dish or other item and join in the fun. Please remember to bring plates and utenstils. See you at the Sandbox! Come out and enjoy some track time. Get ready for the 2015 Summer Series... see poster for details.